First, sorry in advance for the specks/blemishes on some of my photos - I accidentally got sand in my camera! ANYWAY. Back to my weekend! 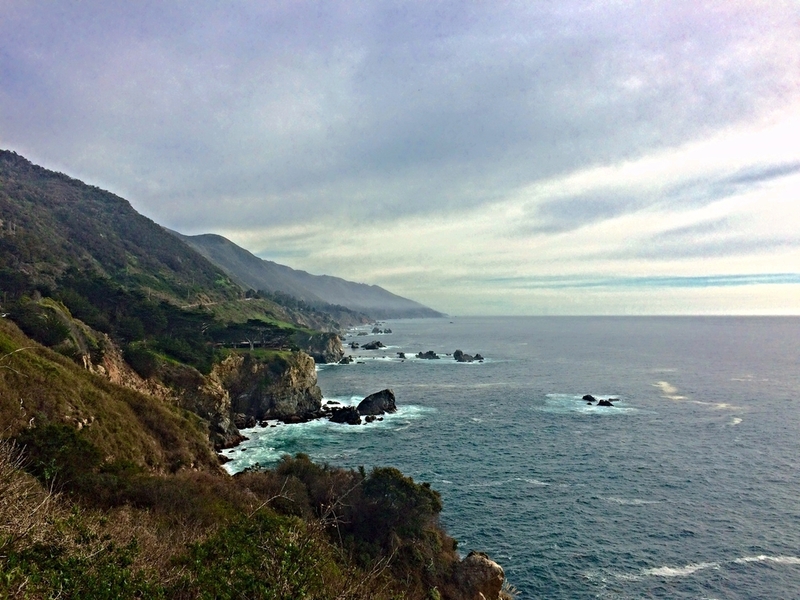 For the long MLK weekend, I went on an impromptu trip to Big Sur! We had been discussing the possibility of this trip for a few days now, but I didn’t really expect it to happen since we hadn’t planned anything by the time Friday rolled around. But, of course, there's an app for that! We found a room for two on the last minute booking app, HotelTonight, on Saturday morning, so my secret hopes for a lazy weekend were squashed. I had been to Big Sur once before, but this quick trip was much different than my previous experiences. Instead of camping and doing a lot of hikes in the redwoods, this time we were staying in a hotel an hour north in Monterey, and spent most of our time on the lovely beaches on the coast. After getting a late start on Saturday, we stopped at Tacos California Grill in Monterey for a quick bite before continuing south to the Big Sur area. My fish tacos were excellent. Great, authentic, and affordable Mexican food, thanks to some quick Yelp research! Big Sur, and the drive down Highway 1, is a great reminder of why I love California and how lucky I am to live near such incredible places. An hour or so later, we ended up at the Pfeiffer State Beach, located 2 miles down a narrow, somewhat bumpy, tree-covered road off of Highway 1. We were initially trying to meet up with a couple friends, but had totally forgotten about the lack of cell phone service in the area! So, after unsuccessfully scanning the other beach-goers for their familiar faces, we decided to just enjoy our insanely good weather and meet up with them when we got back to the hotel that evening. Pfeiffer Beach, nestled in the rugged coastline, featured incredible rock structures and an ever-so-subtle shade of rich purple in the sand. Amongst the caves and tunnels in the big rock structures, there were little nooks that provided privacy and solitude – a great place to feel connected with nature, and also a great place to enjoy a couple beers, as we happened upon another group doing. If only we had thought of that too! With no beer in hand to be a cool kid on the beach, I chose to partake in more innocent activities, i.e. peering into tide pools and exclaiming "Anemone! Like in Finding Nemo!" Everything started to get real pretty as we got closer to dusk. Starting a half hour or so before sunset, we saw a crowd gathering in front of a particular carved tunnel in a huge rock formation. By 5 pm, there were about 30 people, ranging from avid Instagrammers holding their iPhones in outstretched arms for a clear line of vision, to more professional-looking photographers setting up their tripods and meticulously angling their DSLR cameras. We had heard from passers-by that sunset offered an incredible photo opportunity, right when the light radiates perfectly majestically through the tunnel. I think the clouds hugging the horizon might have denied the crowd an epic shot. As we walked by, we didn’t see anything worthy of even an iPhone picture, but I later Googled and saw some pretty breathtaking shots, which made me disappointed on behalf of all those people who lined up, waiting so long for a moment that never came! Elsewhere on the beach, the sunset was looking equally (if not more) majestic than at that tunnel, in my opinion. We drove back to Monterey and had dinner at Cibo, an Italian restaurant across the street. Pretty mediocre food and service, but it was nice to celebrate my first week at my new job with a glass (or two) of wine! The next morning we had a late breakfast at First Awakenings café, down by the wharf in Monterey, which was excellent and reasonably priced. Our brunch gave us just enough time to do a bit of online research about what to do with the rest of our day. On the drive back north, we stopped at the edge of Andrew Molera State Park, where we walked a short 15 minutes to a small beach at the mouth of the Big Sur River. There were quite a few surfers getting in and out of the water, and when we walked up to Molera Point, we were able to watch By this time, it wasn't very light out, but the surf must have been good, given the dozen surfers in the water. Again, the sunset was less than extraordinary, due to a thick layer of fog hovering over the ocean. After poking at things in the tidepools and walking around the beach, we headed back and began our (foggy) drive home to San Francisco. Excursions like these represent many of my favorite things about living in San Francisco. I'm surrounded by people who value and actively connect with nature, and it's really easy to do so. Places like Big Sur are relatively close, excursions don't require extensive planning, and it's never hard to convince anyone to join you!